Samsung's new P400 Pocket Imager projector is designed mainly for businesspeople on the go, so it's pretty tiny. Inside, its DLP unit is a native 800 x 600 resolution and its LED lighting pushes out 150 lumens, resulting in a 30- to 40-inch display capability with 1000:1 contrast ratio. It takes the standard RGB, composite, S-video and audio inputs, and has two 1-watt speakers. Plus, though it's no pico-projector, it's just 5 x 3.7 x 2 inches in size and weighs 1.9 pounds, so it'll carry nicely in your laptop bag. And you know what? Just coz it's businessy doesn't mean it has to look ugly or utilitarian: so Samsung has actually made this thing look pretty good. Available now for $749, full press release below. LAS VEGAS —(Business Wire)— Jun. 18, 2008 Samsung Electronics America, a subsidiary of Samsung Electronics Corporation, a world-leading supplier of professional LCD and PDP display products, today announced the P400 pocket imager that defines style, performance and functionality for today's busy professional. The P400 and the full line of Samsung's projectors will be on display during InfoComm at the Samsung booth, C2417, in the Central Hall of the Las Vegas Convention Center from June 18 - 20. The P400 Pocket Imager allows professionals the ability to easily transport and display information without compromising picture quality. Ideal for road warriors, field sales representatives, business executives and traveling entrepreneurs, the new Pocket Imager provides a creative and dynamic solution that is now both easier and less expensive to utilize. The lightweight, palm-sized DLP projector fits conveniently into a road warrior's computer bag or luggage and sets up in seconds. The P400 also features Samsung's sleek, sophisticated industrial design with a glossy black finish. The Samsung Pocket Imager is small enough to take anywhere and can project images from a variety of sources, including computers, DVD players, video game stations and digital cameras. Utilizing DLP technology, the P400 has a native resolution of 800 x 600 SVGA. In addition to the 1,000:1 contrast ratio, the pocket imager has 150 ANSI lumens for a crisp, clear 30"-40" diagonal image even in a well-lit office setting, and RGB, Composite-In, S-Video, audio-in (RCA L/R) rear inputs for optimal functionality. The P400 features 1-watt (x2) built-in speakers for convenience. Measuring in at 5 inches wide by 3.7 inches deep and 2 inches high, the 1.9-pound pocket imager is both light and portable. Plus, by utilizing LED with a lifespan of up to 30,000 hours, there is no projector lamp to replace. Other offerings included with the P400 Pocket Imager include a remote control, power cables and a sliding lens cap that protects the projector lens without worrying about it falling off or losing it during transit. "We continue to push the boundaries in digital signage and projection and are thrilled to launch the P400 as it expands Samsung's growth into projection mobility for the various environmental application demands," said Christopher Franey, Vice President of Sales and Marketing, Samsung Electronics America Information Technology Division. "The pocket imager's versatility proves to be an ideal digital signage solution for early technology adapters, mobile professionals and style-conscious enthusiasts." Like all Samsung displays and projectors, the P400 pocket imager is backed by a one-year limited warranty on labor and parts, as well as toll-free technical support for the life of the projector. 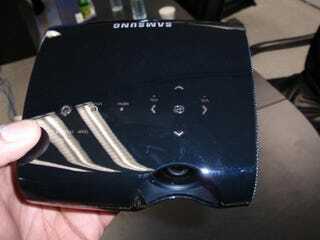 The P400 Pocket Projector is currently available for $749 ESP through Samsung resellers and distribution channels, which can be located by calling 1-800-SAMSUNG or by visiting http://www.samsung.com. Samsung Power Partners receive special promotions, lead referrals, training and technical support, as well as collateral and marketing materials. To find out more about becoming a Samsung Power Partner, visit: http://www.samsungpartner.com.